Chavez is a hero in the Middle East. May 31, 2010 -- The President of the Bolivarian Republic of Venezuela, Commander Hugo Chávez, emphatically condemns the brutal massacre perpetrated by the State of Israel against the members of the Liberty Flotilla, as a result of the war action started by the Israeli Army against defenceless civilians, who tried to carry humanitarian aid supplies to the Palestinian people of the Gaza Strip, who are victims of the criminal blockade imposed by the State of Israel. President Hugo Chávez, on behalf of his government and the Venezuelan people, expresses his deepest regret and sends his deepest condolences to the families and relatives of the heroes who have been victims of this state crime, and commit to honour their memory and to give the necessary help so that the responsible of this murderers are severely punished. The revolutionary government of Venezuela will continue denouncing the terrorist and criminal nature of Israel, and it reaffirms, today more than ever, its unbreakable commitment with the fight of the Palestinian people for freedom, the sovereignty and the dignity. Bicentenary of Venezuela independence celebrations. Photo from Correo del Orinoco. April 19, 2010 -- It is very moving for us to be in Venezuelan today, April 19, commemorating the 200th anniversary of the beginning of the independence struggle, which represented the battles for independence in the Spanish colonies in the Americas. It was the embryo of a first integration process in Latin America, as Simón Bolívar understood the destiny of the peoples of our region very early on. Everything that we do now for the integration of Latin America and the Caribbean began precisely here, on a day like today, two centuries ago. 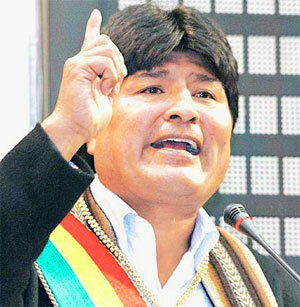 Bolivians mobilise. ``If our government officials are to be wise, they must be pushed by popular initiatives so that the people can feel they are doing it themselves. The state's paternalism, in building socialism, may help at first, but we must create popular protagonism.'' Photo by Ben Dangl. After Copenhagen: Can we save the world? Video: Is the climate sick of us? Ian Angus interviewed by Esquerda.net during the conference O Clima Farto de Nos? (Is the climate sick of us? ), held in Lisbon, March 26-27. The three questions, shown in text in Portuguese, are: Is the climate sick of us? What must be done internationally about this situation? What message would you like to give to the Portuguese people?The video, which is in English with Portuguese subtitles, has also been posted on the website of Portugal's Left Bloc, and on the Esquerda.net channel on YouTube. Official announcement for the II International Conference “Bolivar, Lincoln and Marti in the ‘ALMA’ of our America” to be held in Caracas, Venezuela, November 17 to 20, 2010, within the framework of the bicentennial of the independence of Ibero-America. The first International Conference ‘Marti, Juarez and Lincoln in the ALMA of Our America’ held in October of 2009 in Monterrey, Nuevo Leon, Mexico was convened with the objective of defining the bases for the creation of the Marti Alternative for Our America (ALMA) which would strengthen integration mechanisms such as ALBA and turn into reality the dreams of achieving unity and integration of our Great American Homeland. These bases are contained in the Final Declaration approved which is called the “Declaration of Monterrey”. March 4, 2010 -- On February 23, 2010, Cuban inmate Orlando Zapata Tamayo died after 83 days on hunger strike. He was 42. This is the first such incident in Cuba since inmate Pedro Luis Boitel died in 1972 under similar conditions. The corporate media put the tragic incident on front pages and emphasised the plight of Cuban prisoners. Zapata's dramatic exit sparked a justifiable global uproar. The Cuban prisoner's case undeniably fosters sympathy and a sense of solidarity with a person who expressed his despair and malaise in prison, carrying out his hunger strike to the ultimate consequence. The heartfelt emotion aroused by his case is quite respectable. In contrast, the manipulation of Tamayo's death and of the grief of his family and friends by the corporate media for political purposes violates the basic principles of journalistic ethics. ¿Es creíble Human Rights Watch cuando habla de Cuba? A finales de 2009, la organización Human Rights Watch (HRW), con razón social en Nueva York, publicó un informe titulado Un nuevo Castro, la misma Cuba. Basándose en el testimonio de ex presos, el informe condenaba de manera sistemática al gobierno cubano, calificándolo de tiránico y acusándolo de utilizar “su maquinaria represiva, leyes draconianas y juicios arbitrarios para encarcelar a decenas de personas que osaron ejercer sus libertades fundamentales”. El grupo afirma que entrevistó a 40 prisioneros políticos y que analizó las leyes extraordinarias que permiten que los cubanos puedan ser encarcelados simplemente por expresar opiniones críticas de su sistema socialista. A primera vista, se nos podría perdonar por pensar que Cuba es uno de los peores violadores de los derechos humanos en las Américas. Sin embargo, la más somera reflexión podría llevar a cuestionar tales declaraciones procedentes de los EE.UU., un país con miles de prisioneros mantenidos en una red internacional de cárceles secretas, muchos de ellos sometidos a regímenes de tortura. ¿Es creíble este informe crítico sobre Cuba? ¿A quién representa Human Rights Watch? Human Rights Watch does not see the US blockade of Cuba as a human rights abuse. February 11, 2010 -- In late 2009 the New York-based group Human Rights Watch published a report titled New Castro Same Cuba. Based on the testimony of former prisoners, the report systematically condemns the Cuban government as an “abusive” regime that uses its “repressive machinery … draconian laws and sham trials to incarcerate scores more who have dared to exercise their fundamental freedoms”. The group says it interviewed 40 political prisoners and claims to have identified extraordinary laws by which Cubans can be imprisoned simply for expressing views critical of their socialist system. At first glance one might be forgiven for thinking that Cuba must be among the worst of human rights abusers in the Americas. A little reflection, however, might lead one to question such statements coming from the USA, a country with thousands held in an international network of secret prisons, many subject to torture regimes. So how credible is this scathing report on Cuba? And who does Human Rights Watch represent? January 18, 2010 -- Since 1998, Cuba's health cooperation with Haiti has made it possible for 6000 doctors, paramedics and health technicians to work there. Besides, 450 young Haitians have graduated as doctors from Cuban colleges, free of charge, in the past 12 years. More than 400 Cuban specialists, 344 of them doctors and paramedics, have been in Haiti, jointly sponsored by the United Nations and the Cuban government. But in the wake of last Tuesday's disaster, the largest earthquake ever to hit the Caribbean Basin, Cuba dispatched another team of 60 doctors, health technicians and medications to join the doctors on the ground in Haiti. Cuba has also sent ten tons of medications. January 14, 2010 -- Two days ago [January 12], at almost six o’clock in the evening Cuban time and when, given its geographical location, night had already fallen in Haiti, television stations began to broadcast the news that a violent earthquake -– measuring 7.3 on the Richter scale -– had severely struck Port-au-Prince. 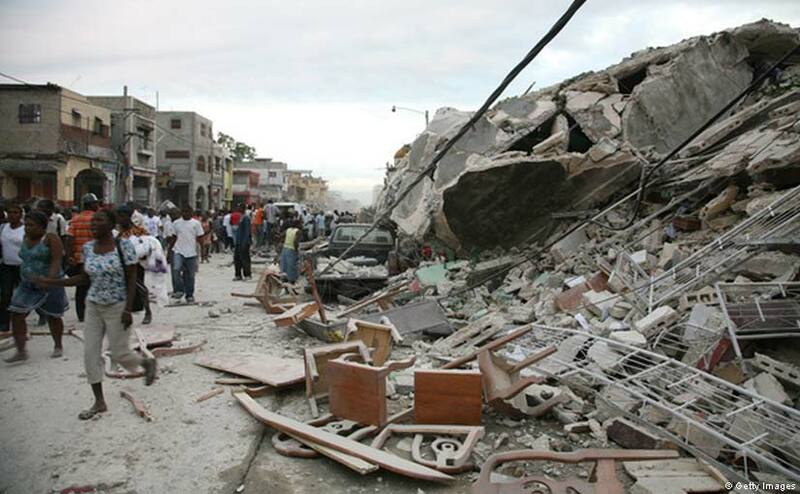 The seismic phenomenon originated from a tectonic fault located in the sea just 15 kilometres from the Haitian capital, a city where 80% of the population inhabit fragile homes built of adobe and mud. The news continued almost without interruption for hours. There was no footage, but it was confirmed that many public buildings, hospitals, schools and more solidly constructed facilities were reported collapsed. I have read that an earthquake of the magnitude of 7.3 is equivalent to the energy released by an explosion of 400,000 tons of TNT. Tragic descriptions were transmitted. Wounded people in the streets were crying out for medical help, surrounded by ruins under which their relatives were buried. No one, however, was able to broadcast a single image for several hours. On January 1, 1959, the hated US-backed Batista dictatorship in Cuba was overthrown by the workers, peasants and students. To mark that momentous occasion Links International Journal of Socialist Renewal is making freely available Resistance Books' Cuba: How the workers and peasants made the revolution, by Chris Slee (2008). Please click HERE to download the pamphlet in pdf format, or read it on screen below. If you would like to purchase a hard copy of the pamphlet, please visit Resistance Books. January 10, 2010 -- Some left groups claim that the Cuban Revolution was made by a few hundred guerrilla fighters, and that the working class played no role. For example Ruth Braham, writing in the Socialist Alternative magazine, claims that the Cuban Revolution “entailed a mere 800 armed guerrillas seizing power, again on behalf of the majority but without their active involvement”. Rebel army enters Havana, January 1, 1959. January 3, 2010 -- As the Cuban Revolution celebrated its 51st anniversary two days ago, memories of that January 1, 1959, came to mind. The outlandish idea that, after half a century — which flew by — we would remember it as if it were yesterday, never occurred to any of us. During the meeting at the Oriente sugar mill on December 28, 1958, with the commander in chief of the enemy’s forces, whose elite units were surrounded without any way out whatsoever, the commander admitted defeat and appealed to our generosity to find a dignified way out for the rest of his forces. He knew of our humane treatment of prisoners and the injured without any exception. He accepted the agreement that I proposed, although I warned him that operations under way would continue. But he travelled to the capital, and, incited by the United States embassy, instigated a coup d’état. Protest in Copenhagen, December 12, 2009. December 26, 2009 -- Climate change is already causing enormous damage and hundreds of millions of poor people are enduring the consequences. The most advanced research centres have claimed that there is little time to avoid an irreversible catastrophe. James Hansen, from the NASA Goddard Institute, has said that a proportion of 350 parts per million of carbon dioxide in the atmosphere is still tolerable; however, the figure today is 390 ppm and growing at a pace of 2 ppm every year. Each one of the past two decades has been the warmest since the first records were taken, while carbon dioxide increased 80 ppm in the past 150 years. The melting of ice in the Artic Sea and of the huge two-kilometre thick ice cap covering Greenland, of the South American glaciers feeding its main fresh water sources and the enormous volume of ice covering Antarctica; of the remaining ice on Mt Kilimanjaro and the Himalayas, and the large frozen area of Siberia are visible. Outstanding scientists fear abrupt quantitative changes in these natural phenomena that bring about the change. December 23, 2009 -- “Nobel War Prize winner walked in and out of a secret door, and that is the way capitalism and the United States Empire will end up leaving the planet, through a secret back door.” So spoke Venezuela President Hugo Chavez from the plenary podium on the last afternoon, December 18, of the 12-day long Copenhagen climate conference (COP15). “While the conference was a failure, it, at least, led to more consciousness of what the problem is for all of us. Now starts a new stage of the struggle for the salvation of humanity, and this is through socialism. Our problem is not just about climate, but about poverty, misery, unnecessary child deaths, discrimination and racism—all related to capitalism”, Chavez said at the Bolivarian Alliance of the Peoples of Latin America (ALBA) press conference held at the Bella Centre immediately following Chavez’ last remarks at the plenary. Copenhagen, December 12, 2009. Photo by Lauren Carroll Harris. December 19, 2009 -- Until very recently, the discussion revolved around the kind of society we would have. Today, the discussion centres on whether human society will survive. These are not dramatic phrases. We must get used to the true facts. Hope is the last thing human beings can relinquish. With truthful arguments, men and women of all ages, especially young people, have waged an exemplary battle at the Copengahen COP15 summit and taught the world a great lesson. "Can a finite Earth support an infinite project? The thesis of capitalism, infinite development, is a destructive pattern, let’s face it. How long are we going to tolerate the current international economic order and prevailing market mechanisms? How long are we going to allow huge epidemics like HIV/AIDS to ravage entire populations? How long are we going to allow the hungry to not eat or to be able to feed their own children? How long are we going to allow millions of children to die from curable diseases? How long will we allow armed conflicts to massacre millions of innocent human beings in order for the powerful to seize the resources of other peoples?" Joint press conference of the ALBA (Bolivia, Cuba, Ecuador, Nicaragua, Venezuela) representatives at COP15, December 10, 2009. “The revolutionary [is] the ideological motor force of the revolution…if he forgets his proletarian internationalism, the revolution which he leads will cease to be an inspiring force and he will sink into a comfortable lethargy, which imperialism, our irreconcilable enemy, will utilize well. Proletarian internationalism is a duty, but it is also a revolutionary necessity. So we educate our people.” -- Che Guevara. November 14, 2009 -- I think that the governments of Cuba, Bolivia and Nicaragua let down the entire Tamil population in the Democratic Socialist Republic of Sri Lanka, as well as “proletarian internationalism” and the “exploited”, by extending unconditional support to Sri Lanka’s racist government.